In the heated theological debate about whether a miracle is a temporary suspension of natural law, or whether Some Higher Power works within nature to create what we perceive as a miracle, The Reader Organisation takes no part. We’re too busy trying to get people reading. But today, during the making of lunch, the matter was unavoidably thrust upon us. Take a look at the picture above. 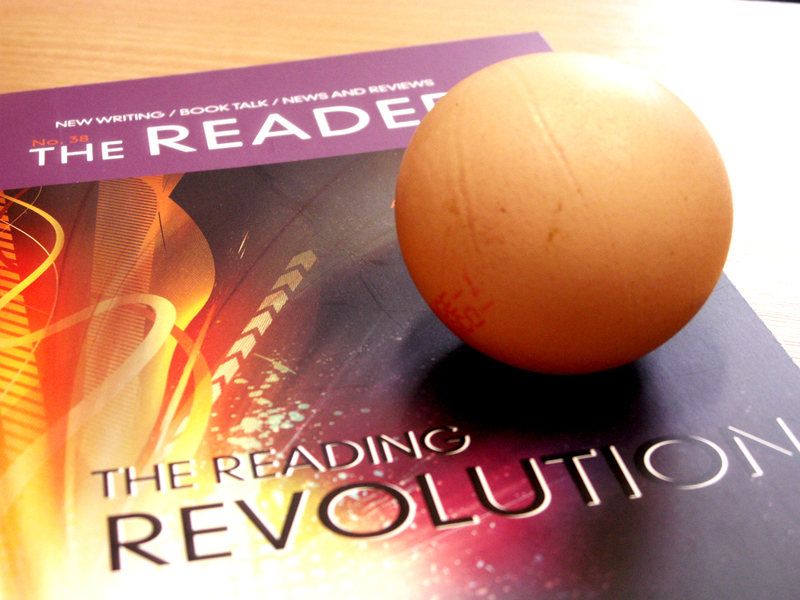 Particularly at the strange, miniature-basketball-like object poised above the latest edition of The Reader magazine. Is it a sign? Very possibly. A symbol? Almost certainly. An egg? Oh yes. And it’s spherical. Perfectly spherical. All good revolutions need their own mythology. The first Reader miracle has, Dickens knows, taken a while to arrive. Now it has, the hermeneutics can begin. Several things, however, are certain: Sonja Sohn’s visit will be an astounding success; England will win the World Cup; and all the peoples of the Earth will put their differences aside and work together to create a better, gentler, more spherical world. The next Read to Lead Workshop will be in Swansea on Tuesday 13th July. This workshop will give you an introduction to The Reader Organisation’s work and ethos, including a chance to experience Get Into Reading for yourself. It was a joy and a privilege to be there. I think it’s such a wonderful thing you’re doing – on so many levels. Very many thanks for an inspiring day. Inform you about full Read to Lead Training courses and the University of Liverpool’s ‘Reading in Practice’ MA. This course is open to people from all professional and social backgrounds: a love of books, a belief in the social value of reading, and a passion to share this vision are what we look for in trainees. The cost of the day is £150, including lunch and refreshments. Places on each Workshop are limited to twelve, to preserve the intimate feel of the groups and to allow everyone a chance to speak and be heard. To book your place, please complete a booking form, available to download from our website, or contact Mark Till, Training Programme Assistant, on 0151 794 2286 or marktill@thereader.org.uk. We have added another Read to Lead Workshop to this year’s schedule, in Liverpool, on Thursday 20th May. It will give you an introduction to our work and ethos, including a chance to experience Get Into Reading for yourself. We hope that it inspires you to seek ways of joining The Reader Organisation as our work develops. Inform you about Read to Lead Accredited Training and the University of Liverpool’s ‘Reading in Practice’ MA. The cost of the day is £150, including lunch and refreshments, to be paid in advance. There is a special rate of £50 for those who attended the New Beginnings Conference and/or Readers’ Day in March. We are also offering, as usual, one ‘no fee’ place on for individuals who cannot pay. She might have seen that what had bowed her head so profoundly – the thought of the world’s concern at her situation – was founded on an illusion. She was not an existence, a passion, a structure of sensations, to anybody but herself. … Almost at a leap Tess thus changed from simple girl to complex woman. Read (in advance if you can) this brave and powerfully moving story of a young woman’s mistakes, second chances, the world’s crass failure to honour these, and Hardy’s – and her own – vital commitment, amid all, to the human scale. Passages will be provided on the day but please bring a copy of the novel with you if possible. To book your place on this Masterclass you need to complete a booking form, which you can download from this page on our website, and return it to Mark Till, Training Programme Assistant, by email marktill@thereader.org.uk or fax 0151 794 2291. Six great story-tellers – Elizabeth Gaskell, Feodor Sologub, George Gissing, Edith Wharton, Bernard MacLaverty and Russell Hoban – show characters coping with difficulties and disappointments, and getting beyond disillusion. Without flinching from the sadness or forgetting the humour, they alter the usual endings of short stories. It’s never too late to discover the power of great writing. With fifty years’ experience teaching the reading of literature, Brian Nellist* continues to bring serious wisdom, deep attention and infectious gusto to this popular summer course. Texts will be provided week by week: the first story will be sent to you when you enrol. So to book your place – before it’s too late! – please complete a booking form which you can download here, or contact Mark Till, Training Programme Assistant, on marktill@thereader.org.uk or 0151 794 2286. *If you haven’t read with Brian before, you can get a taste for the experience here. Come along to read and discuss ‘Lycidas’, John Milton’s haunting pastoral elegy, with other readers in the company of The Reader Organisation’s great literature-lover Brian Nellist. ‘Lycidas’ first appeared in a collection of elegies commemorating the death of Edward King, a schoolmate of Milton’s at Cambridge who drowned when his ship sank off the coast of Wales in August, 1637. With nearly fifty years’ experience teaching the reading of literature, Brian brings serious wisdom, deep attention and inspiring energy to one of John Milton’s greatest works. This is a wonderful opportunity for Get Into Reading practitioners and lovers of literature to hone their skills and explore the hidden depths of this poem. Find out more and download a booking form here, or contact Mark Till, Training Assistant, on marktill@thereader.org.uk or 0151 794 2286. This week, after a good meal, Mr Nellist shares his thoughts on Never Let Me Go (2005), the most recent novel of Kazuo Ishiguro, a British author born in Japan in 1954 and best known for his Booker Prize-winning and Damn Good Film-spawning The Remains of the Day (1989). If you’ve read the novel, please leave a comment and tell us what you thought of it. If you know someone else who’s read it, pass the video on to them. If neither of these statements applies, leave a comment anyway! Lurk no longer. We’d love to hear from you. Mr Nellist shares his thoughts on the work of Willa Cather (1873 – 1947), an American author and Pulitzer Prize winner, known for her depictions of frontier life on the Great Plains (between the Rocky Mountains and the Mississippi River) in novels such as O Pioneers! (1913) and My Ántonia (1918). Plus, inevitably, a short digression on the English and Flemish rabbit.